This wasn’t supposed to be a book. It was my own desire to step fresh into the Word and rediscover what it means to follow Jesus. Can I tell you something? This journey of walking with Jesus is the most amazing, hard, wonderful thing I’ve ever done. I’ve never felt more challenged in my faith, but I’ve also never felt more rested in my faith. It’s simplified it to a modern-day disciple following Jesus daily, listening for His voice, and living it out in real life. Maybe you meet with friends over coffee and talk about Jesus. Maybe you are a Women’s Ministries Director or small group leader. Perhaps you are mentoring women through a prison or campus or discipleship program and you need resources. I have imagined this as a movement of women all over the world stepping into the footsteps of Jesus, going wherever He leads, whatever He asks, whatever miracle He desires to do in or through you. That’s why I desired to invest in these videos and accompanying resources, and offer them at no cost to anyone who desires to use them. The videos can be watched on your phone, IPad, computer, or shot on a big screen in a church or conference. The resources can be easily downloaded or embedded or printed. The only purchase is the book and it’s discounted by several distributors, including Amazon.com and Barnes and Noble (links below). It’s also available through Proverbs 31 Ministries, and 100% of the profit goes back into reaching women through free Online Bible studies, First5, and other ministry to women across the world. If you desire to lead a group in your church, or on Facebook, or if you know of a women’s ministry director who would LOVE to have a free and professional resource for their women, please share this study resource page with them by sending this link: tsuzanneeller.com/come-with-me-study. If you host a group in your church or small group study, I’d love to FaceTime in and say hello and pray with you and your women. Listen to this special recording of Suzie sharing her heart behind Come With Me and the Come With Me Video teaching series. 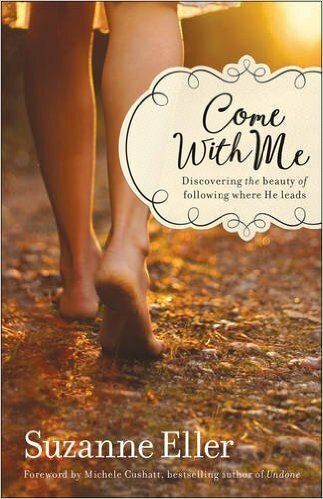 We’re so excited that you are joining us for Suzie Eller’s Come With Me Study (OBS). We’re sharing some tips below if you would like to set up your own OBS group on Facebook. We've assembled a set of chapter quote and discussion starter graphics to aid in the facilitation of your study. Download each of these graphics from the section to the left.